To approach the port, check the precautions wrote on October 31st, 2009, below. The directional guide lights comes into sight once you arrive at 34 57.820N　139 58.500E , which is “CHIKU2” waypoint on my Google Map, just before the red lighthouse. The white guide light pole is in the left back of the red lighthouse. Move close to the pole and then turn left. At Chikura on May 12rh, 2015, I waited for a typhoon to pass. The course of the typhoon was just above or a little bit north of the port. South wind kept blowing. Then, the wind direction shifted to southwesterly after the strongest wind. So, I had to moor the boat to south. 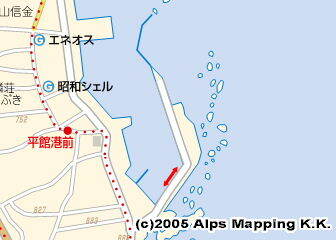 As there is no shelter in the south of the port, the strong wind inside the port was same with the wind outside. To be prepared to the southwesterly wind, a diagonally forward right kedge anchor was desirable. Without pulling from starboard, drifted by strong wind, the boat would hit the quay. To approach Chikura Port, there are a couple of important precautions. But, if you approach Chikura with the certain angle to the directional guide lights from far out at sea, you will put your boat in the middle of the wide fishing nets. Then, you have to approach the port with the directional guide lights after being close to the port entrance. When you approach the port from south, as you will head to the guide lights closing to the port entrance, it won’t be a problem. On the other hand, when you approach the port from north, as the angle to the guide light is almost same with the approaching angle, it will be a problem. Actually, having noticed the fishing nets in the middle, I turned round the boat in haste. Follow the planed red line on my Google Map to keep out of the fishing nets. The blue line shows track chart on which I actually sailed. When I visited Chikura, the weather forecast of the day said northeasterly wind and two meter high waves with swells. It was actually 8 m/s wind. But, the closer I moved to the port entrance, the higher the wave got. Chikura port entrance is very narrow. Trying not to lose the control, I took the helm under tension to enter into the port. As I was nervous even with such wind and wave, I thought it would be difficult to approach the port with stronger wind and higher waves. Remember my experience for your planning. As the port opens to east, waves get higher with northeasterly wind, I thought. The directional guide is shown by the lights. When I entered into the port before noon of a sunny day, it was very easy to identify the green, white and red lights. Head to the light at 34 57.400N　139 57.820E with 240 degree. 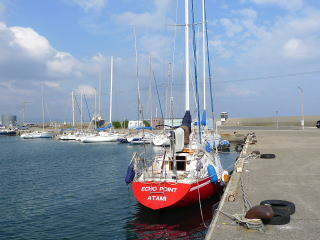 At the east coast of Boso Peninsula, or at Sotobo in Japanese, only Ohara, Katsuura and Chikura can be good ports for sail boats. But, your boat will be affected by foul weather even inside the ports of Ohara and Katsuura. Chikura must be the safest port in the three and a good relaxed port. Keep looking at the guide lights, move close to the entrance, then the sea surface gets suddenly calm after passing by the red lighthouse. Along inside the breakwater on your left, move down south to the back of the port. The inside port area is not so wide. About ten sail boats mooring to the breakwater on your left will come into sight. In the south of those boats, I moored at the innermost breakwater. As the dominant wind is northeasterly, to face to the wind at the bow, mooring alongside is better. As this berth has enough depth and quay space, a larger boat will be able to moor here. To avoid being drifted by wind and hitting the quay, I dropped a kedge anchor. A Japanese magazine said the anchor won’t work well though, it worked at any rate. A local fisherman didn’t say the anchor didn’t work. The members of Chikura Yacht Club were very kind to visitors. In the evening of my arrival, they invited me to the club house and gave me a great feast of Sashimi, sliced raw fish hooked on the day, pumpkin soup, beer and sake. As no boat went out, nobody came to the port while I stayed, I felt somewhat lonely. A western style public toilet is one minute away in front of the boat pool. A water tap of the yacht club is at the quay in front of the boat pool. Ask a club member to use it. There is a big coin laundry 20 minutes away at Teraniwa area on the right side of the road to the station. A traditional Japanese inn at Chikura, Chikura-kan, phone 0470-44-3211, has a good bath, which is available 13:00-17:00 for JPY 1,000 without towel. There are some small shops for provisioning. A mid-size supermarket, Gontaro, is 15-20 minutes away on the left side of the road to the station. Cheap and fresh. A big supermarket, ODOYA, is 20-25 minutes away. Walk further and turn to Kamogawa at the fork with traffic signal for Kamogawa and the station. 50 meters from the fork.A Gyokyo’s gas stand is five minutes away. Walk along the beach to the center of the port.